I’ve always had a soft spot for burgers, and to say that is really an understatement. I grew up loving a good burger; when I first moved to New York I even spent a lot of time searching for the best in the city. Then I went pure vegetarian. The thing is? Going vegetarian or vegan doesn’t have to mean giving up good burgers—giving up good beef burgers, sure, but there are plenty of options out there and if you’re inventive and determined enough, you can make a wonderful burger that’s entirely meatless. 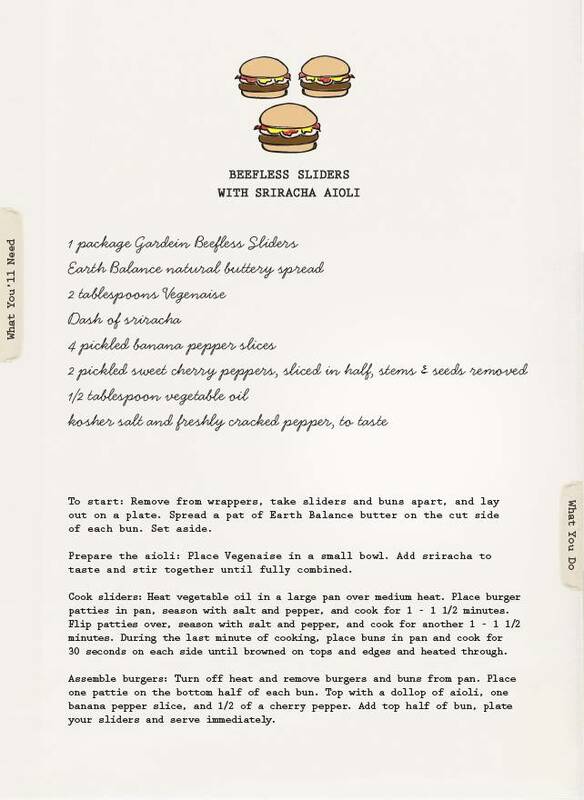 BBQ season is in full swing, and what better time to test out one of Gardein’s newest offerings: Beefless Sliders. These mini burgers even come packaged with vegan buns that were quite tasty. I went the adult route and whipped up an aioli with some heat, then added a couple of varieties of pickled peppers to mine. 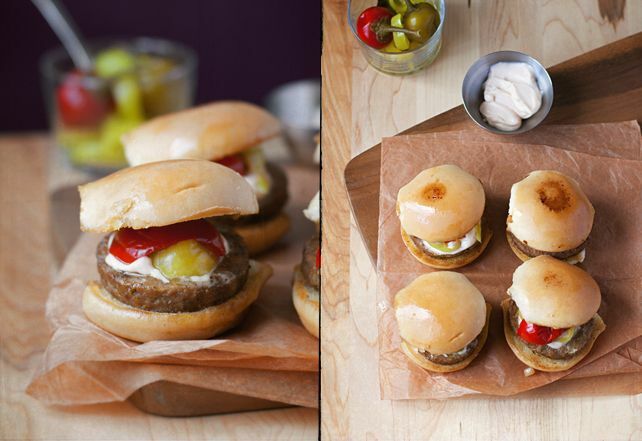 But I especially like the idea of mini burgers for two reasons: serve them with your basic ketchup and cheese (dairy or vegan) and they’re great for kids; also, they’re great for portion control if you’re watching your weight. One thing I really want to mention: Please remember to season your beefless burger patties with kosher or sea salt and freshly cracked pepper prior to cooking, always. This goes for any and all beefless/veggie burgers and mock meats. You wouldn’t cook a steak or a beef burger without seasoning the meat first, would you? Don’t neglect to season your mock meat with basic salt and pepper, even if there is already some type of seasoning on it straight out of the package. I swear, if you do this, you’ll enjoy your beefless burgers, meatless meatballs, chick’n, etc so much more. Gardein’s sliders have a near perfect texture. 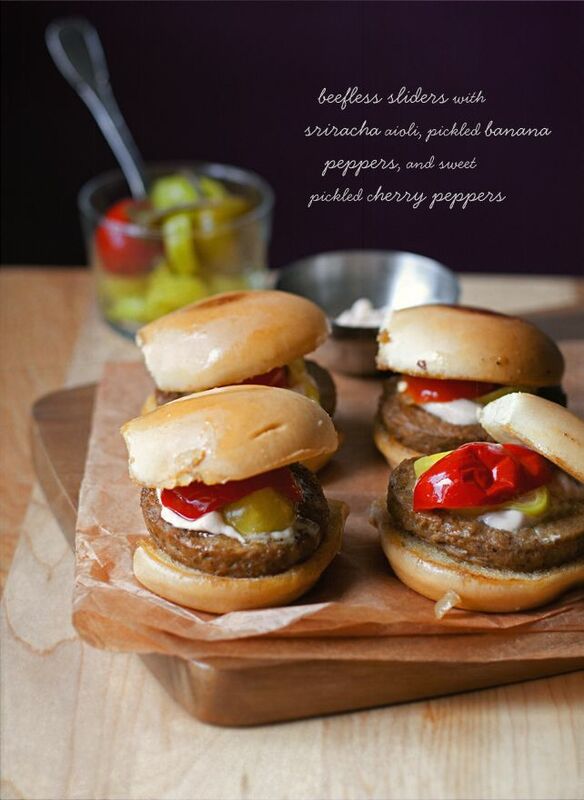 With proper seasoning and bursting-with-flavor toppings, these tasted about as close to beef burgers as you can get. Below is my recipe. Get creative with toppings if you’d like… Let me know what you come up with if you try something different! I love the spicy kick this baby burger has to offer. Adding it to my football tailgate! Thanks so much for the inspiration! what buns are these! they look amazing vegetarian? vegan? if its vegan im booking an airplane ticket to find out how you got a brioche'y bun like that! Those are the buns that come packaged with the Gardein sliders. They are vegan and I think they're really tasty!